Boise Daily Photo: Eventually a Walgreens? This used to be used as....a horse barn? It's near an intersection so it likely will eventually be the site of a strip mall. I guess they'll call it progress but seems a shame the barn can't be rescued. I agree with Gerald. 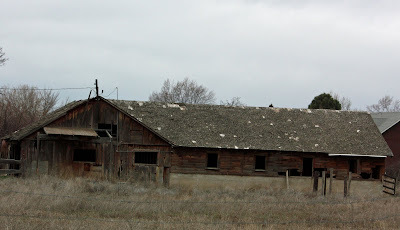 It's been awhile since this barn housed horses, but still hate to see more strip malls...we inundated with them and these days there are a lot of empty spaces...making them especially ugly places! Speaking of building Walgreens, they are building one on the corner of Lake Hazel and Five Mile. Looks abandoned. A perfect place for a stroll with the camera before the building is gone. Perfect for a before and after picture.